WILL SLEIGH DAMAGE DELAY SANTA’S XMAS EVE DELIVERIES? 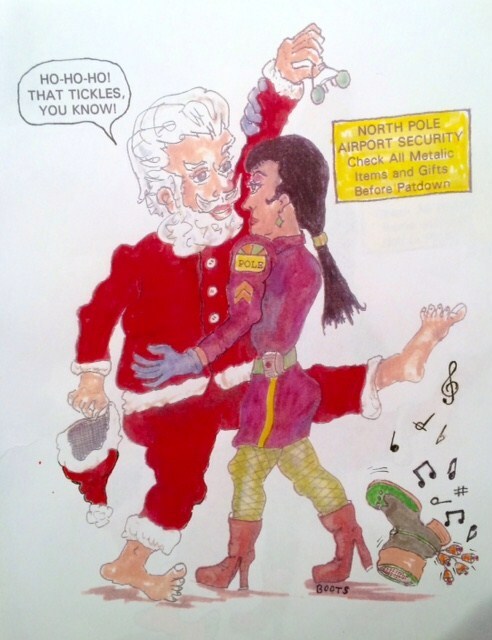 SANTA GETS PAT DOWN AT NORTH POLE AIRPORT. Your pat down brings out my usual H0-Ho-Ho! It tickles so much, it’s misleading, you know? I’m suffering from a case of holiday stress. With deliveries to make, it’s a ridiculous mess! My feisty Elves took a joy ride into the ozone. That’s where they collided with an unmanned drone. So my supersonic sleigh’s in need of repair. On Christmas Eve, it’s gotta take us everywhere! What makes things worse, Rudolph has the flu. His bright red nose has turned dark blue. We’re about to mobilize for the Yuletide rush? If we can’t deliver, so many spirits we’ll crush. Few people are aware of all the work we must do. There are many merry makers who don’t have a clue. You even seized my boots with bells that jingle! Is that any way to treat old Kriss Kringle? poetry and essays about life and ordinary people.